We always look for a seafood restaurant when we're at the coast. I can't say we made the best choice this time, but there's no denying the view from the restaurant was beautiful! 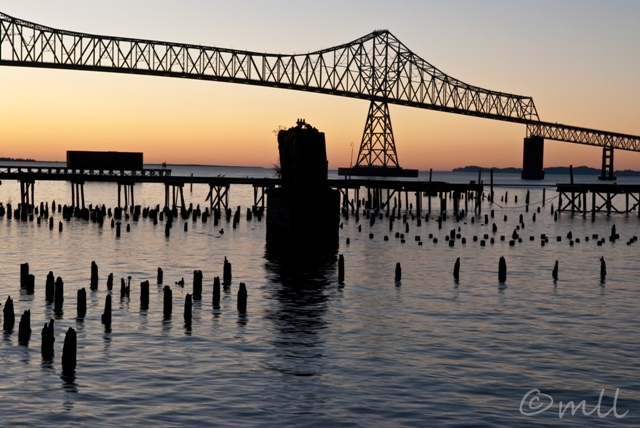 We were right up against a little boardwalk with trolley tracks, and had this pretty view of the bridge connecting Astoria, Oregon and Washington State. The sunset was a bonus. 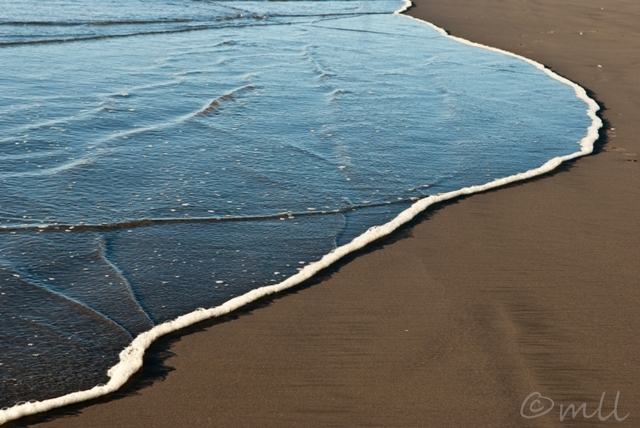 I was so fascinated by the incoming tide patterns near Astoria, Oregon this past weekend. I think we got there at low tide, and every few minutes a gentle wave would try to extend its reach a little further up the beach. And what interested me most was the white outline on each of these waves. 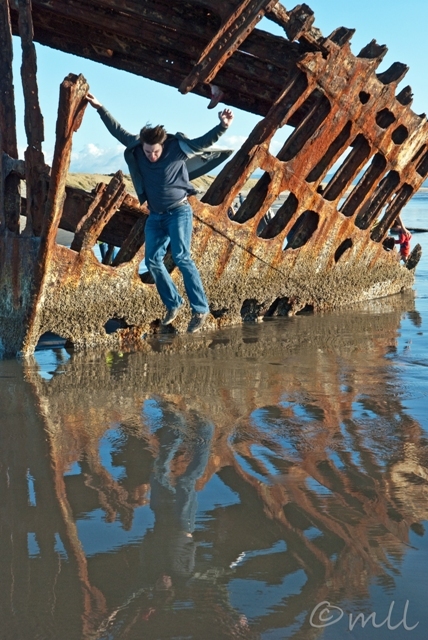 The steel skeleton of the Peter Iredale is all the remains from this barque, run aground in 1906 on its way to the mouth of the Columbia. It's so rusted and barnacle-encrusted that it doesn't look all that sturdy, but it is. And of course it draws a curious crowd. It's not that safe of a playground, but that doesn't stop the adventurous from climbing around and exploring. We were out at the coast today, at Fort Stevens near Astoria. 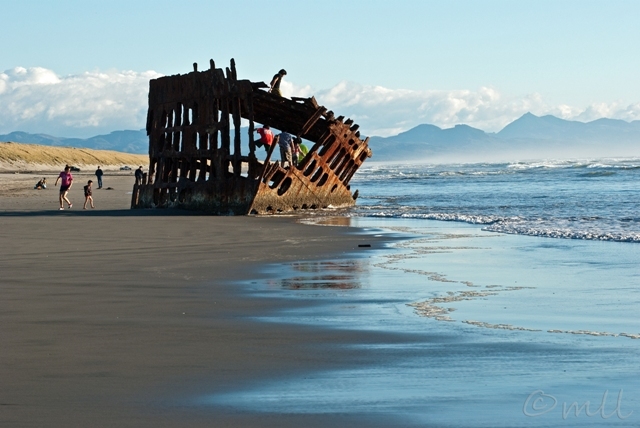 This rusty and barnacled old shipwreck from 1906 draws a lot of attention along the beach there. Eric and I worked our way around the ship trying out different photos, and finally settled on this action pose for fun. I thought this scene was so pretty when I was driving yesterday. It was almost noon and the fog was finally lifting. I think it looks sort of washed out in the photo though, and not quite as pretty as what I saw. Oh well. I might try again; it's on the way to a wonderful country fishmonger that I recently discovered, so I'll be on the lookout for better light when I drive this way in the future. 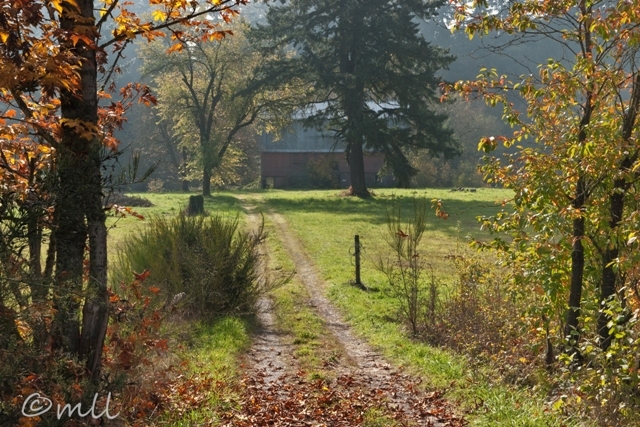 We got invited to a Fall Harvest Party at a CSA farm in Hillsboro last weekend. This tree-lined field is the view from the front of the beautiful old farmhouse there. Draper Girls Country Farm doesn't just sell apples and apple products. Right now they are also selling pears and other seasonal crops. I didn't see any plums for sale, but there must have been earlier in the season. I found a plum under these trees, and did an internet search for plum trees in autumn; my detective work indicates that I was standing in a row of plum trees. Who knew they turned so yellow in the fall? I wish the light weren't so harsh on the lower right side. I should have visited at a different time of day, I guess. Spectacular view of Mt. 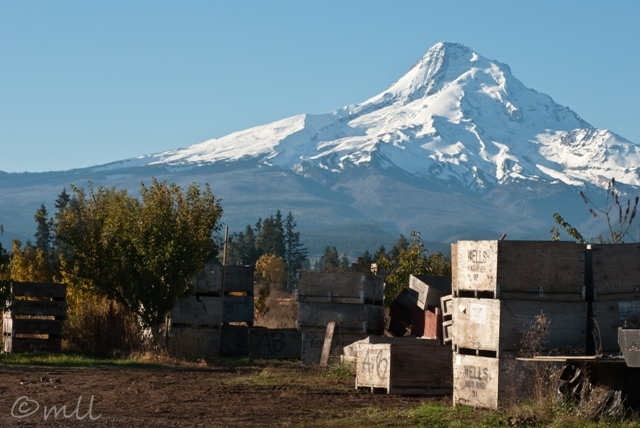 Hood from the back of Draper Girls Country Farm on the Hood River Valley's "Fruit Loop." It's a similar view from almost every orchard in the valley; such an idyllic setting to grow and sell fruit! Always one of my favorite trees. I love the color variation in the fall, and the prickly fruit. No fruit/seeds visible on this little tree. Beautiful color though. Well, it was the last cross country meet of the season for us today. 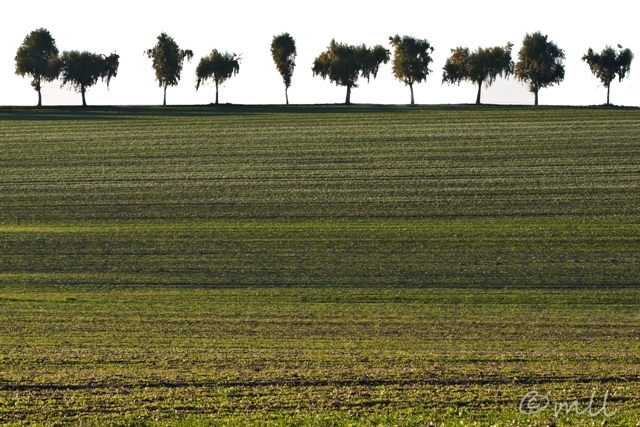 The Finn Hill Challenge, not far from the Venersborg School that I photographed a few weeks ago. I thought this area was a historic Swedish community, but now I'm thinking it's Finnish. The name Finn Hill could have given it away, but it didn't occur to me until I read the Finnish quote on the runners' tags: SISU- Finnish word for "not only great insurance, but the determination not to stop." One thing I love about cross country meets is they're always at a beautiful outdoor location. Today was no exception; we were at a very pretty park and the fall weather was perfect. 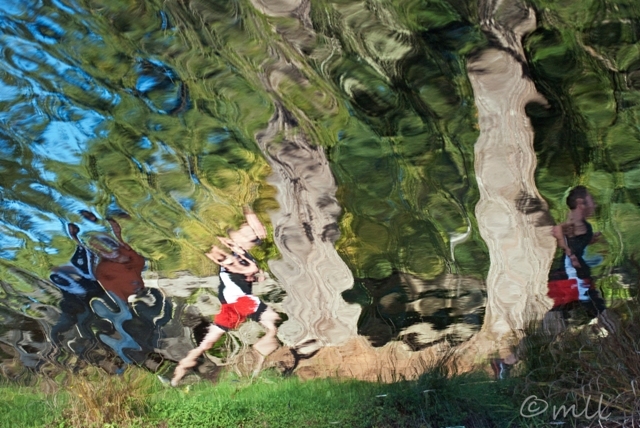 The park had a pond with a gentle ripple, so of course I gravitated to the reflection and photographed the race from this more abstract perspective. I'm sorry to see the season end, but have to admit I'm happy for the change in schedule too. 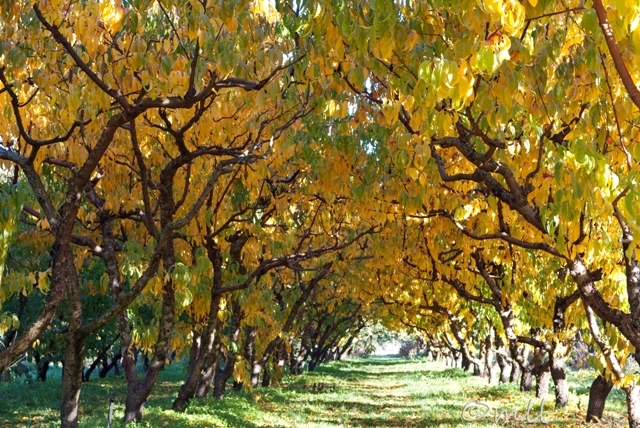 Sunday we drove to Hood River Valley and along the Fruit Loop, which is a 35 mile loop through the valley that takes you past several dozen orchards and vineyards, as well as a few specialty farms like lavender, chestnuts, and alpaca yarn. We had beautiful weather for apple picking, and I have a new favorite apple orchard, Mt. View. 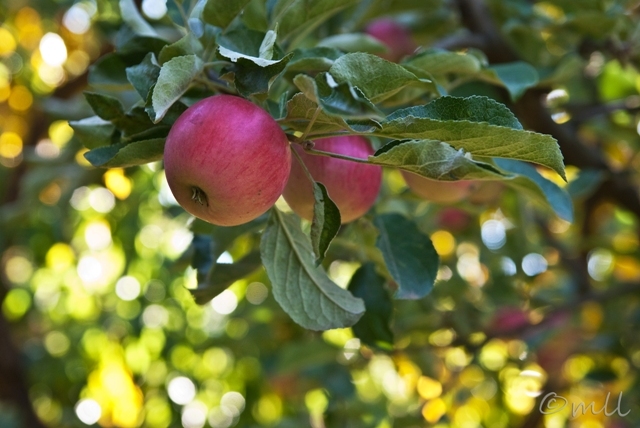 The trees were loaded with apples and the picking was easy. Each tree had a label tied onto it so you could tell the apple variety. There were dozens of different kinds of apples and pears. I got my usual 2 1/2 bushels, so it will be a busy applesauce-canning week around here! 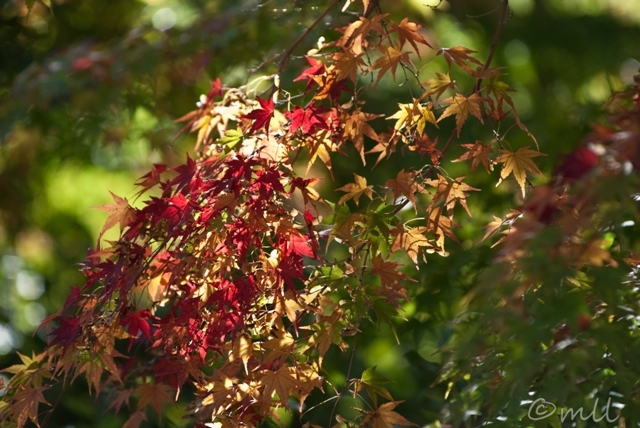 I decided that the yellowish brown leaves are big leaf maple, although the leaf shape varies a little bit from my book. There's quite a bit of variation in what I'm seeing on the ground too, with the smaller leaves the size of an outstretched hand, and the largest of the leaves probably a foot across. 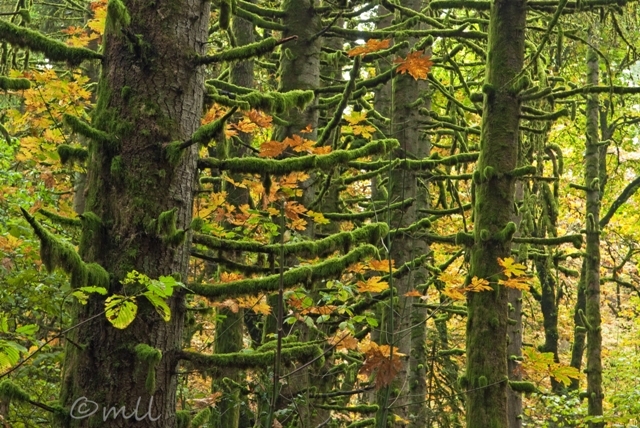 The moss-covered branches are a pretty common sight in woods around here. My friend from Olympia calls them monkey tail branches, but when I did an image search with that name, a completely different tree comes up. It seems like there should be a name for these understory branches. Anyway, I remember struggling with this moss green color when I first started the blog and was living in Olympia. The green just overwhelms the photo and casts a tint on everything! 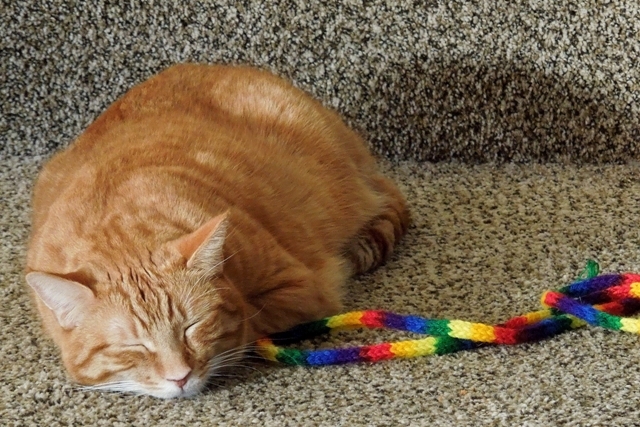 Back at the beginning of the year, I talked about wanting to really learn Photoshop this year. I do feel like I've learned some things, but finally decided to sign up for a class. One of the things I hope to learn is how to tame this green a little without losing the sense of lushness. There are five or six different loops in this horse-friendly park. I've only explored two so far. I haven't seen any horses out here yet, but there are always fresh hoof prints in the mud, and plenty of horse farms nearby. I've pulled out my Pacific Coast Tree Finder for tomorrow morning, so hopefully when I post tomorrow I will be able to name these trees with confidence. I'm guessing that the yellow leaves with the brown spots might be big leaf maple, but I'll confirm that next time I post them. Anyway, it seems to be about peak time for color, so I'll try to get a few more trips out here this week, while I've got a another color to balance all this green. Not that I need an excuse...it's so peaceful out here. This will probably be a regular walking spot for me and Clover! Thick fog around here this morning. It's a weather pattern we'll have around for a few more days, with morning fog and afternoon sun. 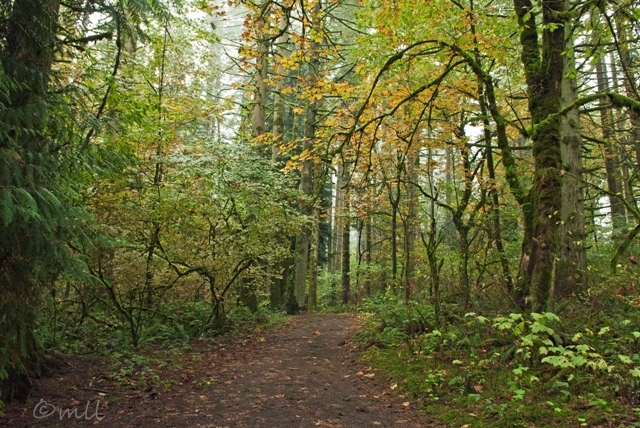 Clover and I drove to the horse trails today and wandered around in the woods there. 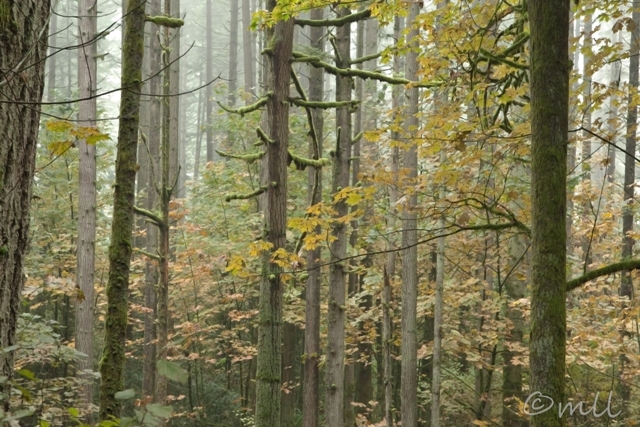 I'll post a few more photos that actually show the trail, but for today, I liked this foggy scene. 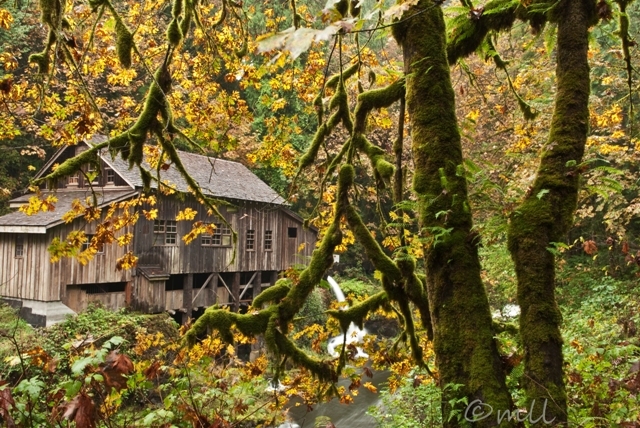 Well, here is the photo of the grist mill I promised. The light was not that great today either, but I decided to post it anyway, and maybe include a better shot at a later date. Mainly because I've hardly been posting anything lately. Whatever this tree in the foreground is, the leaves would probably have been a pretty yellow last week before our heavy rains, but today, all the leaves were covered in big brown spots. Combined with all the moss that covers bark and rock here, it makes for an interesting color combination! There's an easy clear shot of the mill, but the colors were really washed out from that angle, so I opted to go with this messier foreground just because it was a more interesting scene with the leaves backlit in this light. I think it brightened the scene up quite a bit.